Single-sided card printers as they imply will print on one side of your cards. Print secure IDs, personnel badges, gift cards and financial badges. Our single printers provide high quality print quality at an affordable cost. You can choose from low-to medium print and are some of the best on the market. They are ideal for low-to medium-volume single sided printing applications that require minimal operator training and excellent print quality. 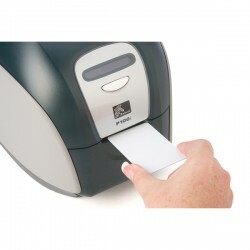 A reliable desktop card printer featuring fast print speeds and high-quality imaging ..